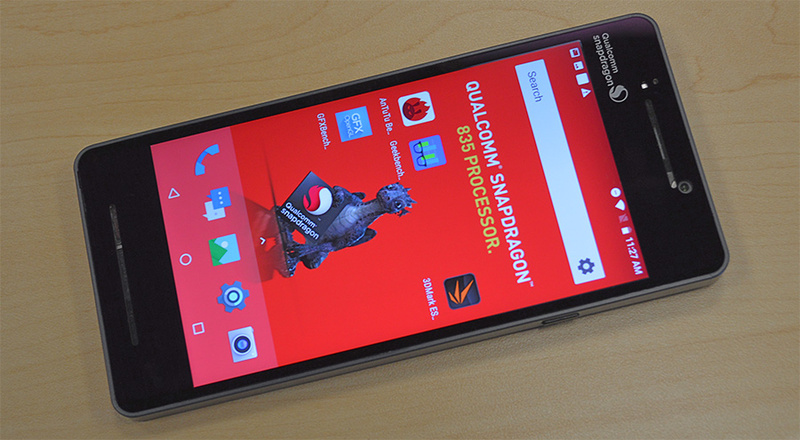 The Snapdragon 820 SoC was a significant milestone on Qualcomm’s roadmap. It was a solid improvement over the 808/810, delivering higher performance and efficiency, and became a commercial success, finding its way into the majority of flagship phones last year. 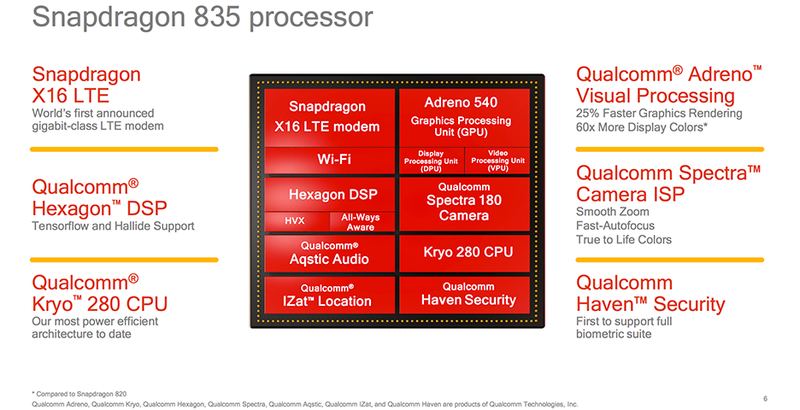 More importantly, it heralded Qualcomm’s vision for mobile devices: heterogeneous computing. This meant new hardware—a much improved Hexagon 680 DSP that added single instruction, multiple data (SIMD) Hexagon Vector Extensions (HVX); Qualcomm’s first fully-custom 64-bit CPU core, Kryo, which focused on improving floating-point IPC; and an updated Adreno GPU with strong ALU performance—for enabling new software technologies and user experiences—artificial intelligence for smarter personal assistants, machine learning for object recognition, computational photography for better image and video quality, and new AR/VR experiences. 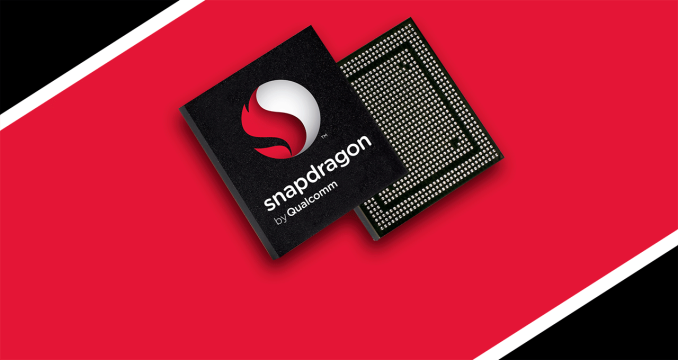 Snapdragon 835—now a part of Qualcomm’s Snapdragon Mobile Platform that includes all of the company’s mobile hardware and software—is an evolutionary product that builds on this vision. The greater than 3 billion transistor SoC is the first to use Samsung’s 10nm "10LPE" FinFET process, which reduces overall package size by 35% relative to Snapdragon 820. The new SoC’s CPU transplant and X16 LTE modem, which tops out at 1Gbps (Category 16) on the downlink, are the biggest changes, but most of the other blocks within the SoC have received at least minor updates too. For detailed information about all the changes and new features, you can read our Snapdragon 835 launch article. In what has become an annual tradition going all the way back to Snapdragon 800, Qualcomm invited the media to its headquarters in San Diego for some feature demonstrations and limited testing using the company's Mobile Development Platform (MDP) devices. These are fully functional tablets or smartphones in a slightly oversized, utilitarian chassis used for hardware testing and software development. The MDP for Snapdragon 810 took the form of a tablet, while Snapdragon 820 came inside a large smartphone with a 6.2-inch display. This downsizing trend continues for Snapdragon 835, whose MDP/S is a smartphone with 6GB of RAM, a 5.5-inch 2560x1440 display, and a small 2850 mAh battery. The use of a smaller chassis is encouraging, because it has less mass and surface area to absorb and dissipate heat. This suggests a lower TDP for the 835, but we'll need to measure power consumption to be sure. Because we only had a limited time for testing, we focused on running some basic CPU, GPU, and memory performance tests. Keep in mind that we were testing prototype hardware running pre-production software that resulted in a few hiccups. The condensed testing period also forced us to stray slightly from our usual testing methodology. Therefore, these numbers should be viewed as preliminary and could change by the time retail units begin shipping.